In our capacity as a competent partner for everything to do with industrial installations, we focus on offering an all-inclusive service. Our 360° support encompasses planning, implementation, and supervision of our customers’ projects. 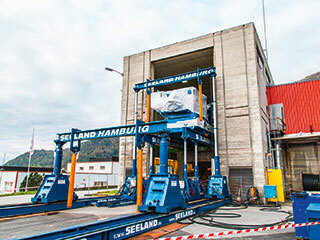 We take on machine and plant relocation projects, as well as the assembly of heavy machinery and precision engineering equipment, with innovative implementation solutions, such as strand jacks, industrial rollers, lifting gantry technology, and skidways. Armed with our specialized equipment, we are ready to go anywhere in or outside Germany.